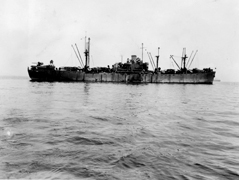 On May 8, 1943, I came aboard the just commissioned cargo ship USS Eridanus AK 92. Soon sailed for South Pacific with Cargo Small Groupe Marines. Earned a battle star February 1944 in assist in taking Bougainville. Left ship September 21, 1944. 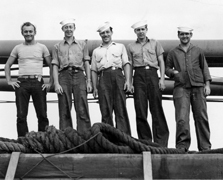 February 19, 1945 came aboard USS Albiero K 90 cargo ship. Left ship January 29, 1946. Came aboard USS Admiral Capps, a personnel carrier, January 29, 1946. Left ship February 26, 1946.